Sidewalk Astronomy Evangelism – Taking It to the Streets! We have discovered that sidewalk astronomy is a unique way to get people talking about God. Set up a telescope in a public place, and it becomes a people magnet: passersby just naturally want to know what celestial object you are looking at. 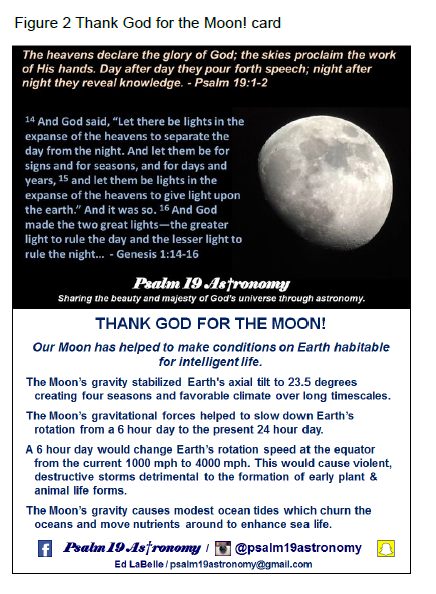 Psalm 19 Astronomy Society is a sidewalk astronomy outreach ministry formed in Austin, Texas, in 2016 to promote the science of astronomy, foster astronomical education, and strive to show that there is harmony between the universe (God’s World) and the Bible (God’s Word). ​These verses, written about 3000 years ago and accredited to King David of Israel, speak of how God revealed Himself through His created world. Hence the mission of Psalm 19 Astronomy is to share the beauty and majesty of God’s universe through sidewalk astronomy. "Our Sun is the right age (a mid-life star), the right size (not too big or too small), has the right amount of solar activity (not too violent or too quiet), and has the right elemental composition (not too metal-rich or too metal-poor) to support intelligent life." The society’s outreach ministry team consists of several amateur astronomers from the Austin area. They have been setting up their telescopes one Friday night each month on the Pfluger Pedestrian Bridge near downtown Austin. This bridge is a popular place at night with local Austinites and visitors from around the globe. It is part of the Austin Hike and Bike trail over the city’s downtown Lady Bird Lake and has a wonderful view of the ever-expanding downtown Austin to the east. There is also an amazing view of the sun setting to the west. The telescopes used by the ministry team range in size from the small but powerful Questar 3.5” Maksutov-Cassegrain to the fully computerized Celestron Evolution 8” Schmidt-Cassegrain to a homemade 13” Dobson light bucket. The bigger the eye, the more you can see! On a typical occasion, around 100 to 150 pedestrians will peer into one of the scopes to see the Moon and planets that may be visible that evening. A photo of the Moon taken through the eyepiece of the telescope with a smartphone is a popular keepsake for passersby that they often instantly share with friends and on social media. As mentioned previously, the society promotes the science of astronomy and fosters astronomical education. To accomplish these goals, we have developed a series of astronomy cards to hand out to passersby. Each card has Psalm 19:1-2 on the front and covers a single topic such as the planets, the Moon, Jupiter, or the Sun. For example, the Planets card (Figure 1) has information about each planet: their order and distance from the Sun, their diameter, and how many moons each planet has. Many people are surprised to learn that Jupiter has 67 moons and Saturn has 62. Attention is specifically drawn to the visible moons when we have our telescopes tracking either Jupiter or Saturn. The four Galilean moons of Jupiter are easily visible in even the smallest of telescopes. Galileo was one of the first people to observe Jupiter about 400 years ago in his modified telescope. Our Thank God for the Moon! card (Figure 2) details several properties of the Moon that helped make conditions on Earth habitable for intelligent life. These include: a) stabilizing Earth’s axial tilt to 23.5 degrees, thus creating four predictable seasons, b) slowing our planet’s rotation rate to a pleasant 24 hours, which also reduces surface winds, and c) churning up the nutrients in the oceans through stronger tidal activity due to the Moon’s gravity. 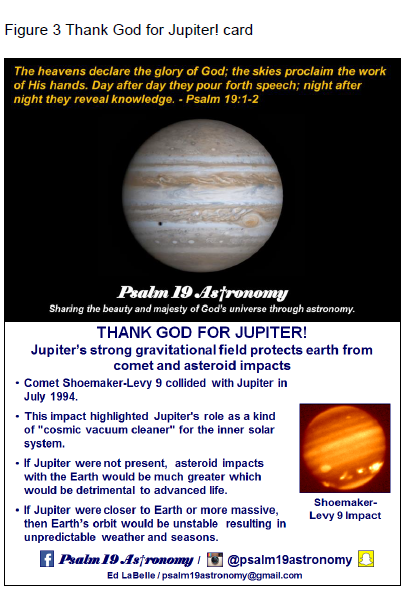 We also have a Thank God for Jupiter! card (Figure 3) with scientific information on how Jupiter helps to protect Earth from devastating asteroid and comet impacts. Jupiter is nicknamed “the vacuum cleaner of the solar system” because of its enormous gravitational pull and close proximity to the inner Solar System. Its powerful pull snaps up passing comets, asteroids, and other debris from the Oort Cloud. Without Jupiter’s massive gravitational influence, scientists estimate that Earth would be impacted by a large asteroid every 1-3 million years. Such frequent impacts would have devastating consequences and likely prevent the stable planetary conditions required for advanced life to take hold. And lastly, we have a Thank God for our Perfect Sun! card (Figure 4). 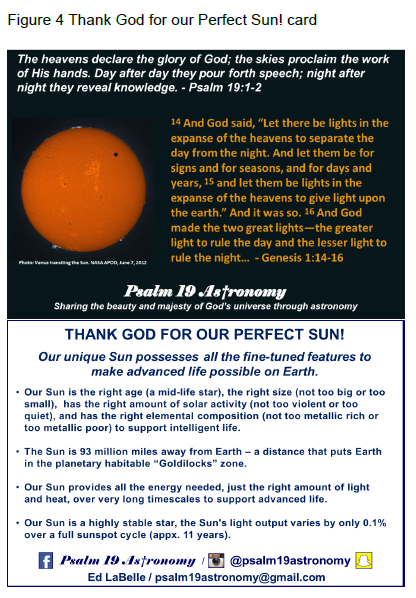 Earth has been gifted by God with a “just right” star to provide our planet with all the energy needed – just the right amount of light and heat over very long timescales, to support human beings created in His image. Our Sun is the right age (a mid-life star), the right size (not too big or too small), has the right amount of solar activity (not too violent or too quiet), and has the right elemental composition (not too metal-rich or too metal-poor) to support intelligent life. Psalm 19 Astronomy has hosted events at several other locations in addition to downtown Austin. These include the University of Texas, the Hemisphere Plaza in San Antonio, as well as Burnet and Horseshoe Bay, Texas. This past June, our team members started hosting events at the Square in Georgetown, Texas, on a monthly basis. Our sidewalk astronomy ministry has been expanding to other locations around the U.S. through the use of social media. We have over 300 followers on our Facebook group page, including people from all around the globe. Events have been hosted by other amateur astronomers in Gastonia, NC; Benbrook, TX; Mesquite, TX; and Clear Lake, TX. Other groups are ramping up in Tennessee and Minnesota. And this year we hosted our first international event in Cruzeta, Brazil, where about 400 people looked at the Moon and planets on two evenings in July. 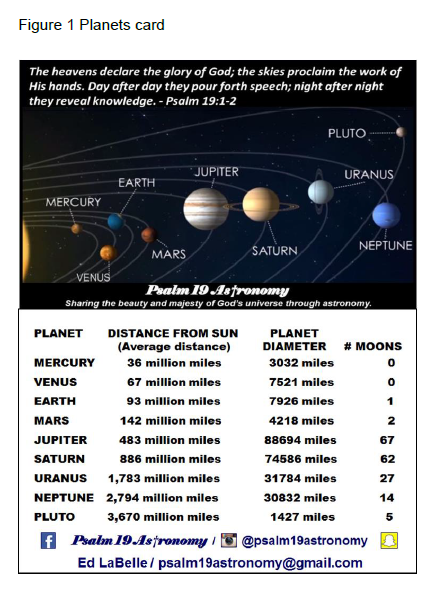 If you would like to learn more about this ministry or are interested in hosting a Psalm 19 Astronomy event near you, contact us via our Facebook page (facebook.com/groups/psalm19astronomy) or email us at psalm19astronomy@gmail.com. Ed LaBelle has a B.S. in Electrical Engineering from Texas A&M University. He has 30 years’ experience as an engineer in the semiconductor industry. He is currently a member of the technical staff for Applied Materials, Inc. and works in their technology consultancy group. He is a member of Bethany United Methodist Church in Austin, Texas, where he is a coordinator for their youth confirmation class. Ed taught Sunday school for many years to middle and high school age youth and most recently taught apologetics to Bethany’s high school students. Ed is an officer with the Austin Chapter of the Reasons to Believe faith and science ministry started by astrophysicist Dr. Hugh Ross. Ed has been an amateur astronomer since 2009 and founded the Psalm 19 Astronomy sidewalk astronomy ministry in 2016.